Duratrack provides a range of fabrication services, including custom metal stamping, designed to supply customers with a single source for all of their metal component and subassembly needs. This filter mounting bracket is stamped from 0.11″ thick hot rolled steel with a pickled and oiled finish and meets dimensional tolerances as tight as ±0.005″. The bracket was stamped on our transfer press and tapped with our multi-head tapping machine. 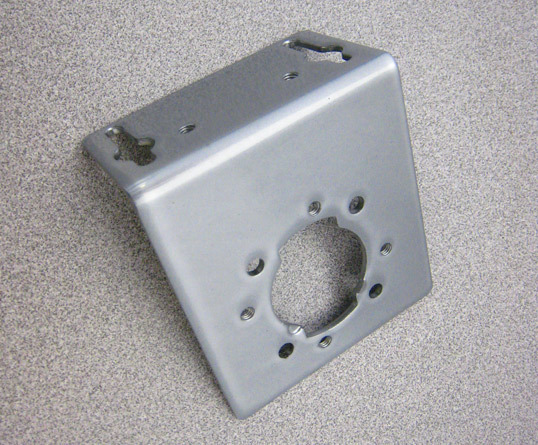 The finished bracket is 3.62″ x 3.25″ x 1.81″ and finished with an approximately 30 mils thick powder coating. In process inspections were performed according to customer specifications using calipers, height gauges, thread gauges, and coating thickness gauges. This bracket is used in a water treatment filter application so proper adhesion of the powder coat is essential to the life of the part. We produce 180,000 of these brackets per year. This project demonstrates our ability to manufacture and finish high volume items with exceptional quality at competitive prices. For more information about this custom metal stamping project, see the table below, or contact us directly. 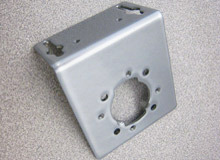 This mounting bracket is used on a water treatment filter application.